The online version of this article (doi: 10.1186/1471-2466-14-186) contains supplementary material, which is available to authorized users. Chronic Obstructive Pulmonary Disease (COPD) is a medical condition with multiple comorbidities . One of the most common is depression that occurs in 10 to 42% of persons with COPD and is associated with low quality of life [2, 3]. Depression is associated with increased frequency of hospital admissions, prolonged length of stay, increased number of consultations, low compliance with medical treatment and premature death [4, 5, 6]. The etiology of depression in COPD is unknown. It is supposed that a genetic predisposition is more likely to exist, followed by the environmental assaults imposed by the respiratory illness itself and the direct neuropsychiatric effects of chronic respiratory disease . Little is known regarding variables associated to COPD that may predict depression [8, 9, 10]. It was hypothesized that COPD patients with symptoms of depression could report higher CAT scores (because of worse health status) compared to those without depression, as CAT scores are strongly positively correlated with St George’s Respiratory Questionnaire (SGRQ) scores . Several studies addressed this issue, [11, 12, 13, 14, 15, 16] and found that CAT scores are significantly associated with the presence of symptoms of depression measured by Hospital Anxiety and Depression Scale (HADS) or patient health questionnaire-9 (PHQ-9) scores, but to the best of our knowledge, there is no data evaluating the association between CAT scores and major depression diagnosed by a psychiatric evaluation. The association between depression and CAT scores could be a bias once these mentioned depression scores may indicate symptoms suggestive of depression, but not necessarily the diagnosis of a depression disease . 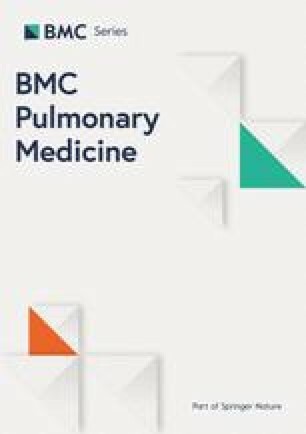 The aim of the present study is to determine the association between CAT score and major depression diagnosed according to the Diagnostic and Statistical Manual of Mental Disorders (DSM IV) criteria by a psychiatric evaluation among clinically stable out-patient COPD subjects with mild hypoxemia. Clinically stable COPD patients aged 40 years and over admitted to the Research Center of CLARE Out-patient Chest Clinic between April 1st and September 31st, 2013 were considered eligible and invited to take part of the study. After signing the informed consent, an instrument of data collection was applied, and a digital oximetry was performed to select only mild daytime hypoxemic patients. Subjects with oxygen saturation level < 90% (moderate to severe daytime hypoxemic patients), or ≥95% (normal oximetry), or with a FEV1/FVC >70 (not COPD by GOLD criteria) were excluded. They subsequently performed clinical evaluation, psychiatric evaluation, spirometry, polysomnography, echocardiography, arterial blood gas analysis, chest radiograph and validated questionnaires of dyspnea , health impairment (COPD Assessment Test - CAT) , socioeconomic status , and depression (Beck Depression Inventory - BDI, second revision) . Exclusion criteria of the study were pregnancy, recent myocardial infarction (less than three months), asthma previous medical history or any other concomitant pulmonary disease, use of drugs associated with depression (lipophilic β-blockers, anabolic steroids, digoxin, levodopa, benzodiazepines and pemoline), history of cancer diagnosis, presence of renal insufficiency or performing dialysis, presence of insulin dependent diabetes, presence of resting PaO2 < 60 mmHg, presence of radiographic evidence of any significant abnormality not attributable to COPD, inability to understand or complete all questionnaires, tests and interviews. Clinical stability was defined as the absence of exacerbation  for the previous four weeks. Smoking status was categorized as current smokers, ex-smokers and never-smokers . Major depression was diagnosed according to the Diagnostic and Statistical Manual of Mental Disorders, 4th edition (DSM IV) criteria by a psychiatric evaluation and was measured by the Beck Depression Inventory (BDI), second revision . COPD subjects were classified using the GOLD criteria (chronic respiratory symptoms, history of exposure to risk factors for the disease, and post-bronchodilator FEV1/FVC ratio <70 in the spirometric evaluation) . Nocturnal hypoxemia was defined as an oxygen saturation level <90% for at least 5 minutes, with a nadir oxygen saturation level of ≤85%, and was considered significant when occurring at least 30% of the total sleep time [26, 27, 28, 29]. The polysomnography was performed using Alice 5 Diagnostic Sleep System (Murrysville, PA, USA) in a sleep laboratory. Recordings were interpreted and sleep stages were determined according to recommendations provided by the American Academy of Sleep Medicine . Our findings showed that CAT may be a predictor variable of major depression among COPD patients with mild hypoxemia. As CAT score is routinely used among COPD patients, value above 20 may be used as a screening test for an additional evaluation with a specific depression questionnaire. Although it is not the first time that CAT is associated with depression, it is the first manuscript demonstrating the association between CAT and major depression diagnosed by DSM IV. The majority of the studies that reported CAT-depression association [11, 13, 14, 15, 16] were not designed specifically to investigate this issue, but addressing other primary objectives found weak to moderate correlations as a secondary finding: Hilmarsen et al. , using the Hospital Anxiety and Depression Scale (HADS), assessing COPD patients with symptoms of anxiety and/or depression reported a worse disease-specific health status assessed by CAT in comparison with patients without these symptoms (r = 0.35). 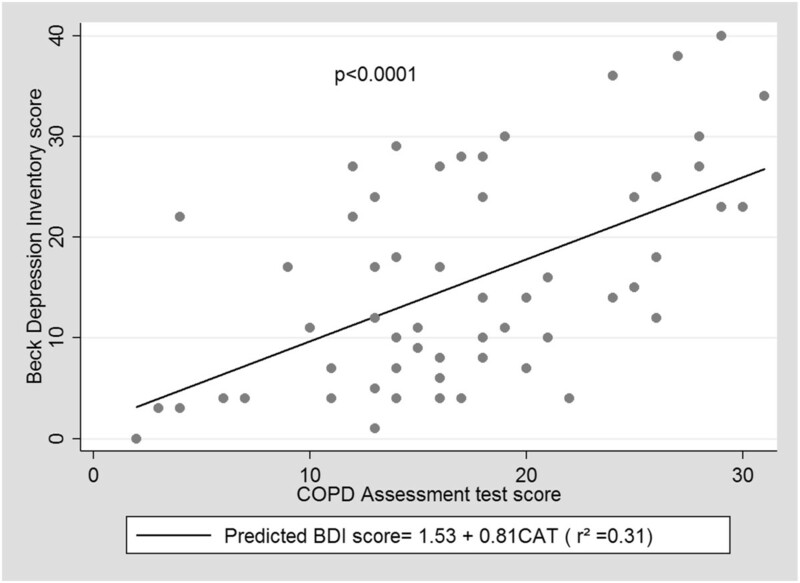 Miyazaki et al., studying a COPD cohort designed to prospectively investigate the management of COPD comorbidities, found that the presence of depression (HADS-D ≥ 11) was significantly associated with increased scores of CAT (r2 = 0.15) . Different studies found weak correlations (0.30 to 0.39) between CAT scores and depression scores measured by HADS [14, 15, 16]. 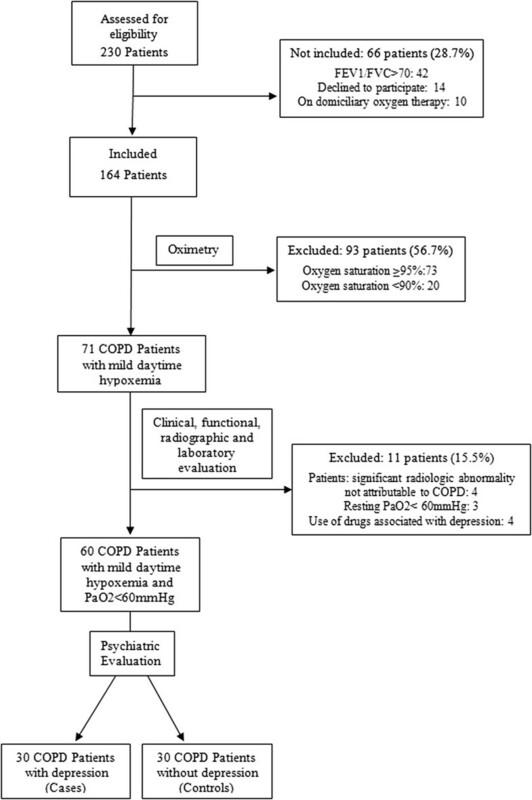 A study designed to investigate the association between CAT and depression specifically among COPD patients found a good correlation (r = 0.63) between CAT ≥21 and depression as diagnosed by the patient health questionnaire-9 (PHQ-9) . Although there are several screening tools available to identify depressive patients (Beck Depression Inventory, second revision, Center for Epidemiologic Studies Depression Scale (CES-D), Geriatric Depression Scale (GDS), Hospital Anxiety and Depression Scale (HADS), Patient Health Questionnaire-9 (PHQ-9)) , none of them are currently used in the level of the primary care setting [12, 34]. CAT is a COPD-specific health status measure  and although it has already been demonstrated that it correlates with depression symptoms [11, 12, 13, 14, 15, 16], we showed that it could not replace a specific case finding tool  to identify major depression. However, our findings suggests that a CAT >20 was strongly associated with major depression (OR 7.88; 95% CI 1.96 - 31.7) and could be an important tool for depression screening purposes among COPD patients with mild hypoxemia.